There is no shortage of places in Stockholm where to indulge in Spanish tapas. 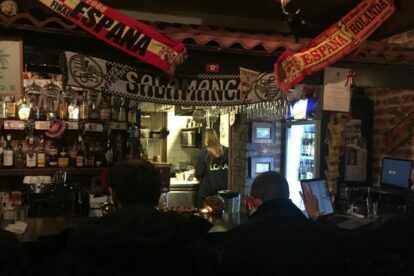 Since the early 90s, when the first tapas restaurant opened on Kungsholmen, today you’ll find the Spanish lager Cruz Campo or Catalan Estrella Dam in all of the main neighbourhoods in the city. In a country where eating out isn’t cheap by southern European standards, enjoying some tapas is a popular option when a quick bite and a drink is all you really want. My personal favorite is the small bar and restaurant Olé Olé on Kungsholmen. The Spanish owners, who are always present behind the bar and in the kitchen, serve the simple standard tapas you’d find in a similar bar in Madrid, or possibly Salamanca, the hometown of one them. The place quickly gets crowded all days of the week except on Sundays when they stay closed. Booking a table ahead of time is therefore advised. The Spanish ex-pat community has chosen Olé Olé as their bar of choice. My first Spanish teacher made me order in Spanish to the amusement of the waiters. Good place to practice the language he claimed. I still do.